On Saturday 27th November, about 400 Leithers braved the beginnings of the snow and ice and turned out to participate in £eith Decides, an innovative approach to funding community projects. Twenty five projects, from Pulse of the Place (drumming for young people) to the Friends of Montgomery Street Park improvement plan, gathered at Leith Academy (currently celebrating its 450th anniversary!) to make a pitch for a share of the £16,602 that the Leith Neighbourhood Partnership had set aside for community activities. Each project was asked to make a 3 minute presentation for their share of the money. The audience turnout was fantastic despite the night-before’s blizzard having left the pavement uncomfortably iced over, and at the end of the afternoon 21 groups received a share of the money. It was a fantastic exercise in giving the community ownership over how their money is spent. The process we used is called Participatory Budgeting. This gives communities control over funds allocated for a specific purpose. It extends democracy beyond the ballot box and into the budget process and is important as it gives people more confidence in how their money is spent. It was remarkable how no-one I spoke to at the event thought a penny of the money had been wasted … that’s not how most people feel about public expenditure most of the time. Each person attending, however old or young, was allowed a vote on each of the projects, which had been grouped into four categories; Community, Children and Young People, Environment, and Employment Skills. Each category attracted a wide range of projects. Some of the presentations were impressively designed and the drumming by Pulse of the Place certainly got everyone’s attention at the start. 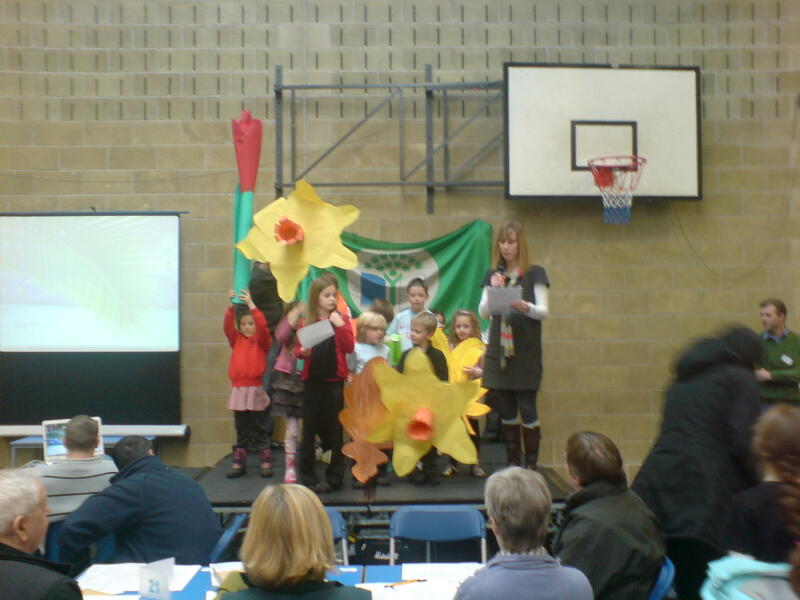 The presentation by Hermitage Park School Association featuring giant daffodils was clearly the result of a great deal of work, and the Friends of Leith Primary’s presentation for a climbing wall was very well put together. Bethany Christian Trust had a touching speech from a man recovering from alcohol abuse who wanted a cooker to help him and others with substance problems to learn how to cook. The most important lesson from £eith Decides is that there is a real public appetite to be involved in the process of allocating funds. The most important challenge is how we encourage the Council to move from its over-centralised and exclusive budget system to allocating money in the transparent and accountable way that Participatory Budgeting events like £eith Decides allow. In Brazil and in cities like Hamburg people are often engaged in widespread decision making on how government money is spent. The result is a virtuous circle of more engagement and more satisfaction with how money is spent. Even where people lose out they are happier having had the opportunity to go in front of their peers, than having decisions made behind closed doors. On a personal level I particularly enjoyed being able to announce the results surrounded by excited children, whose projects were getting money to do great things. I hope the Leith Neighbourhood Partnership will be able to continue with this process. I particularly hope that it will pressure the Council to be more transparent and accountable in its spending. And I hope that everyone who participated in the event on Saturday found it as useful as did I. Its an ingenious approach and certainly worth giving a go. It gives people an idea of the hard decisions that have to be made on spending.